Catch a falling ball and put it in your pocket, never let it - well, never let it touch a different colour. That's Spin Out for you, an arcade collection game from Random Salad Games that has a lot of promise. The concept behind Spin Out is rather simple. 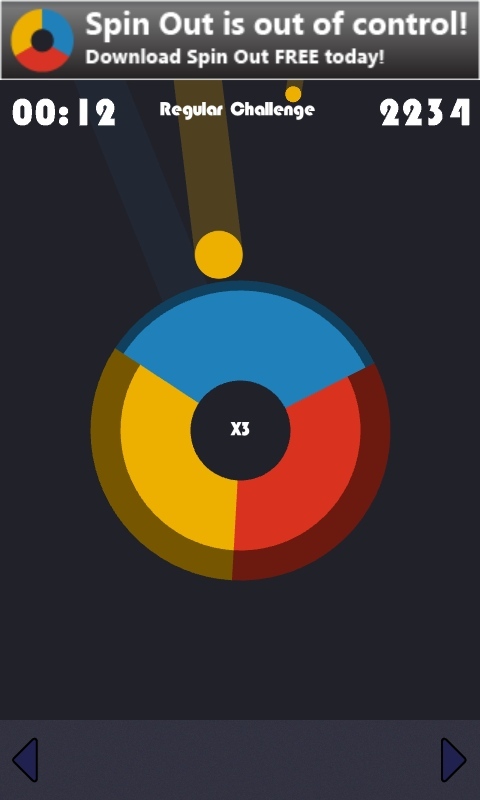 The central disc in the game is segmented into three colours (red, yellow, and blue), and as you play, various sizes of coloured balls will fall from the edges of the screen towards the centre of the disc. All you need to do is spin the disc to capture the colours in the segment with the same colour. If you do, then you'll score points. If you miss, and it lands in the wrong colour, then that colour will drop in size. If the segment vanishes and a coloured ball hits the centre disc, then it's game over. 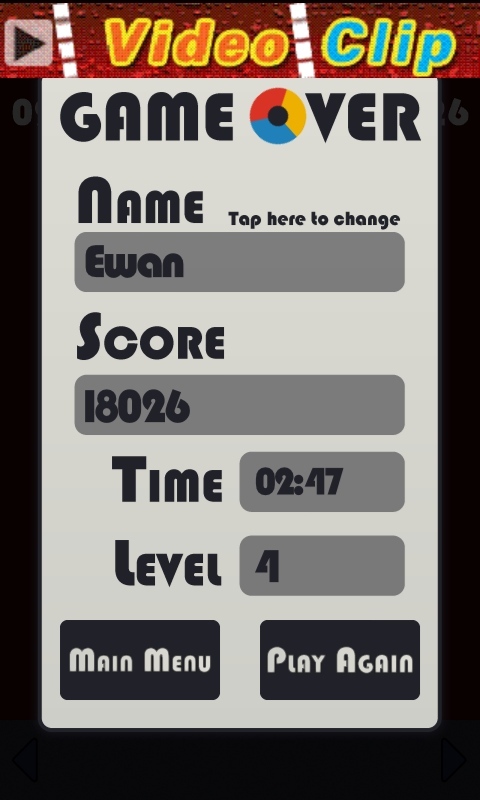 The regular game goes through a number of levels, mostly based on speed and frequency of the balls, so as you start a new game you can go from very beginning, the major checkpoints in the game, or at the last level you completed. This keeps the game matched up with your skill level in catching the balls. 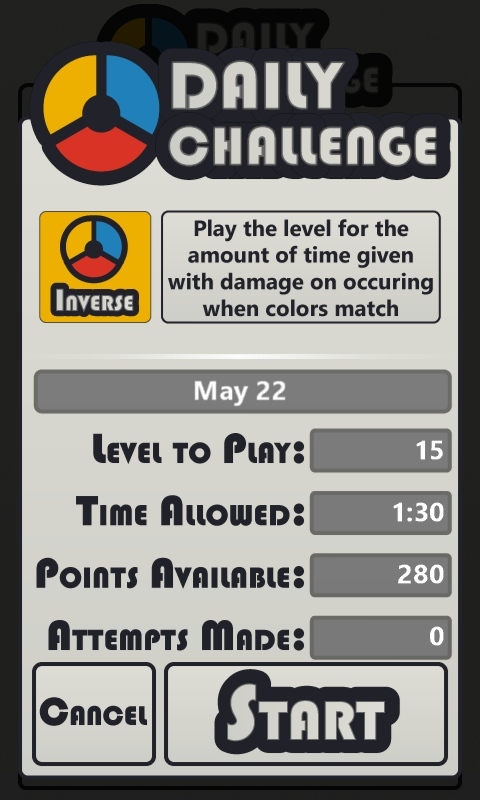 To keep things fresh, Spin Out also has a 'Daily Challenges' section, which gives you shorter tasks, such as scoring as many points as possible in a certain time, or to survive a fixed time without taking any damage to the central disc. 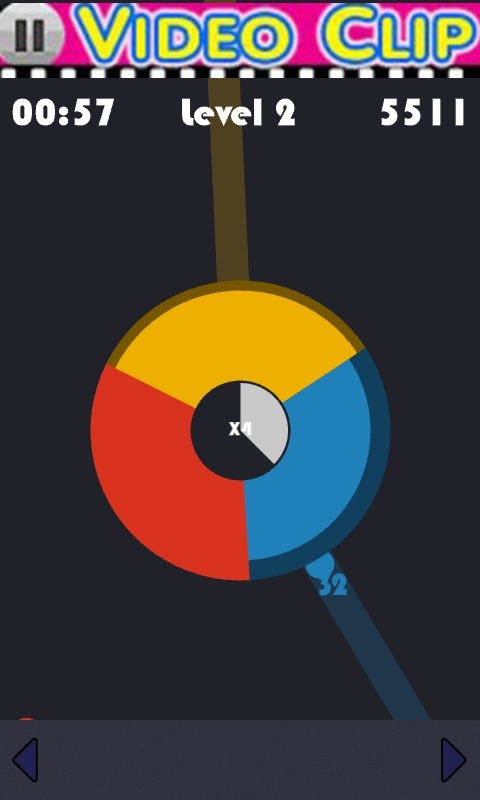 There's also the infuriating daily opposite game, where you need to spin the disc so a coloured ball lands in a colour that does not match, which is a bit of a mind bending experience if you've been playing for any length of time and you're starting to get an automatic response in your fingers as you spin the disc around. I like that there are two control options for Spin Out. Both of them are based on the touch screen, but they are both slightly different, although you can switch between them during a game without pausing or toggling an option. The obvious way to spin the disc is to put your finger on it and spin it - thankfully this works and I suspect many people will start off by using this method. It's instinctive and easy to understand, and more importantly very accurate in terms of positioning (and, forgiving collision detection in the UI, means that if it looks 'close' to getting a colour and a ball matched up then you'll get away with it), but your finger and hand will obscure some of the gameplay area. That's where the second control method comes in, namely the coloured strip at the bottom of the screen. Slide your finger over to the left to spin the disc anti-clockwise, and to the right to go clockwise. It keeps your fingers out of the way, but it can be quite sensitive so the first few times you play you will overcompensate the spin. But it is the method I think that you'll be using once you reach the later levels. Spin Out is, ultimately, a frustrating title. It's not a frustrating game as such, the mechanics work, it's a good concept, and the challenge ramps up nicely. It's frustrating because I want to see more from the game. I want to see more colour slices appear on the disc as the difficulty level increases. I want to see more physics in the movement of the balls, perhaps orbiting the disc like planets round a gravity well. I want to see something more than distinct blobs of colour as the graphics. I want to see some flair. And I want to see a way to remove the in-game advertising by supporting the developer. I like Spin Out, and if it matures a little more, I could grow to love Spin Out. Right now it has promise, and I'll happily support it, but it's time to push the envelope just a little more.